Ever wonder what happens to your Facebook account when you die? Now, full control over that belongs to you. Starting today, you can designate someone on Facebook as your “legacy contact,” enabling them to manage basic functions of your account after your death. Assigning someone as your legacy contact has very different implications than simply giving an heir your Facebook password. Your legacy contact will be able to pin a memorial message at the top of your profile, change your profile picture and respond to new friend requests on your behalf. They will not, however, be able to post as you, edit posts left by others, access your private messages, delete content or delete your account as a whole. 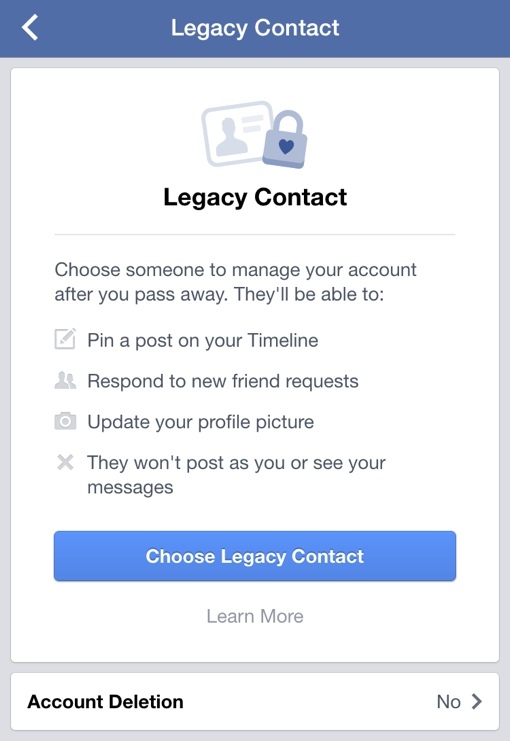 Your Facebook account will be frozen and memorialized upon your death if you choose not to name a legacy contact. If you do not choose a legacy contact but name a digital heir in your will, Facebook will be able to name that heir as your legacy contact posthumously. Setting a Facebook legacy contact is optional, but Techlicious highly recommends you take a moment out of your day to do so for peace of mind. It can be done in seconds by going to Settings > Security > Legacy Contact. The person you designate must be a Facebook member. You can also choose to simply have your entire account deleted upon death. These settings can be changed at any time so long as you’re living, but they cannot be changed after your death.